Tonight I'm linking up over the Clutter-Free Classroom Winter Break Linky Party. Click on the link below to join in on the fun! Over my short, short break, I spent a lot of time avoiding this. My teacher bag, which I parked in my office from the Wednesday, December 21st until today. I usually love working ahead, developing lessons and activities over long breaks but not this year. Other than setting up my teaching blog, I thought very little about school and I needed it. I spent lots of time with my husband and my friends. It was glorious. 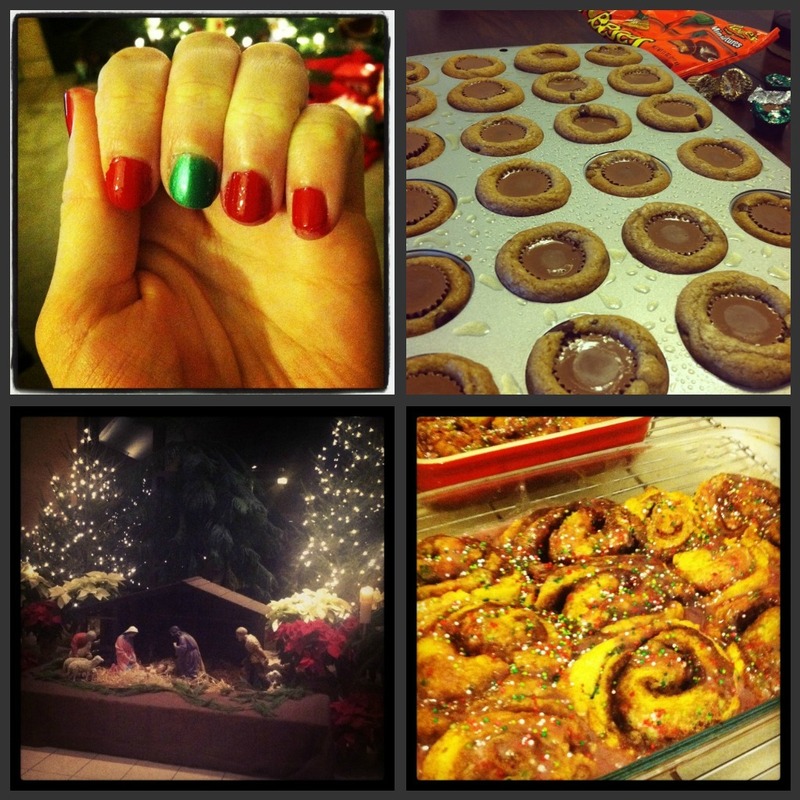 I painted my nails, I made cookies, I celebrated the true meaning of the season and I made cinnamon rolls on Christmas. I love every minute of it. I needed the break because I've been working, working, working, working most of my waking hours on school since it began. A week before school started, I found out I was being transferred to another school and grade due to a small decrease in enrollment at my school and a small increase in enrollment at another. Suddenly, I went from being a part of a dynamic, innovative third grade team to a second grade team where I am the youngest teacher by twenty years and I am really struggling. At my old school, I taught with one of my best friends. It was the best. It's wonderful working with someone you can confide in personally and professionally. It has been hard. So hard. I have learned a lot about myself during this time and discovered I am more of a leader than I ever thought I was, but it has been hard. My third grade team and I might not have always seen eye to eye on things but we got it done. We divided up work for tiered activities, Smartboard lessons and unit plans. We might not have loved everything that we shared with one another but it's a lot easier to fix something you don't love, than starting everything from scratch. We worked smarter, not harder, as a unit and I miss that. A lot. This year things are definitely harder. The ladies I work with are nice. They certainly appreciate what I share but are not able to replicate, nor do I expect them to. They also constantly forget this isn't my first dog and pony show. I've been teaching for five years now, and no you do not need to remind me to make parent gifts at Christmas or send home a letter about my holiday party. So I've been working, working, working to create materials that allow me to remain faithful to my teaching style and philosophy. It has meant long, long hours and feeling like I am in my first year all over again. This year has been isolating because I don't have someone to share ideas with or just talk with and I'm very lonely at my school. I am so, so, so thankful for the Teaching Blog World, it shows me daily I am not alone and now through my blog, I have people to share things with and learn from. I am so excited about where blogging may take me during year and I want to wish each of you a Happy, Happy New Year! I also want to thank you for actually reading this very, very, very long post! So tell me in a comment, what was your favorite thing about your winter break? I so, so loved spending time with my friends from my former school. It was so needed! Welcome to blogland! I hope you have a great new year! I just found your super cute blog! I'm so sorry about your current teaching situation. I did LOL at the clipart comment!! I still have a week off to enjoy (I did teach right up until the 23rd). I have loved reading, visiting with friends, enjoying the fireplace and a cup of tea and just relaxing. My teacher bag is parked in the same spot too, I may have to take a look in a day or two :) I have found some great ideas in blog land and did find a cute book to start things off when we get back. I enjoyed reading your post, I am in my second year at a new school and I hear you about colleagues set in their old school ways, sigh. Keep trying !! I can relate to your trials of this year being moved at the end of last year, moved again at the beginning of this one! It's been rough but blogging has really helped! Hope you find lots of support and inspiration here!